Over the past three years, singer/songwriter Bill Miller has produced two amazing projects, SPIRIT RAIN and CEDAR DREAM SONGS that exemplify his artistry by blending the Native American and western folk/blues traditions in something wholly new. These are works of a man who knows first-hand life's keenest joys and sorrows, a man who distills experience into a potent musical style. 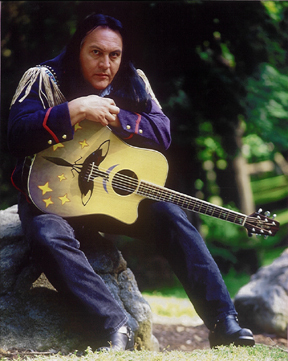 A Mohican Indian from northern Wisconsin, Bill Miller has long been one of the most admired figures in the Native American music arena and beyond. As an award-winning recording artist, performer, songwriter, activist, and painter, he's been a voice for the voiceless, a link between two great and clashing civilizations. On SPIRIT RAIN, he walks the path of reconciliation in a set of fourteen heartfelt songs and evocative instrumentals. Co-produced by Bill and Michael von Muchow, and written or co-written entirely by Bill, SPIRIT RAIN took the singer back to his roots. It was recorded at Actual Sound Studios in La Crosse, WI, not far from the Stockbridge-Munsee Reservation he called home. "It was very different from being in a media center like L.A. or Nashville," says Bill. "Everyone turned off their cell phones. My buddies and I would go fishing on the Mississippi River. The recording was low-tech too: 16-tracks, no digital. I could have pushed it technically, but I felt closer to the spirit doing it this way." That spirit comes through on songs like the prayerful "You Are The Rain," the acoustic-flavored "Rain Down Your Love," "The Promise," and "Never Too Far," which celebrate the divine glory of sky, prairie, mountain and rain. Says Bill, "This album is about attaining a measure of wisdom through suffering. It's about the pieces of my life." That sentiment rings true in songs like "Face The Blues," a hot-blooded blues tune about being knocked down and getting back up again. Tracks like "I Believe" and "Love Sustained" make bold statements about living out one's personal credo, while songs like "Little Brother (Spirit Rain)" and "Underneath The Blue Sky" ingeniously adapt traditional Native American musical conventions to the folk/rock idiom. Instrumentals like "Approaching Thunder," "Sun Dog," and "Red Sky Heart" showcase Bill's mastery of the Native American flute, while "1st Dream" is a thrilling chant-and-drum song performed by members of the Ho-Chunk Nation. Perhaps the album's most touching track is "Prayers For The Truth," which restates all that the Native American community hold sacred, while offering forgiveness to those that nearly annihilated an entire people. "I don't want anyone to carry around this guilt," says Bill. "All we need is to be allowed to speak, to mourn, to express anger, then be allowed to forgive our oppressors. That could lead to a deeply powerful spiritual change in the U.S. and the world. It could be a statement about the peacemaking that comes with courage." Digging deep with music and art is nothing new to Bill Miller. With music, he discovered a way out of the entrenched poverty of the reservation, and he has used his talent to build bridges where ever he goes. The son of Mohican-German parents, Bill grew up amid the streams and woodlands of the reservation (his tribe is properly called Mahicanuk, which means People From Where The Waters Are Never Still). Even then, water made a deep impression. "I've always been connected to water," says Bill. "My reservation was in northern Wisconsin, so I grew up near lakes and rivers. There's a mystical energy in water. Every Native creation story has water in it." Music was an also essential part of life, and Bill (whose Indian name, Fush-Ya Heay Ka, means "bird song") learned traditional songs at an early age. "We didn't have much," he recalls. "There was nothing but woods, trout and a Zenith radio that picked up AM stations across the country. I'd hear Barbra Streisand, The Beatles, Stones, B.B. King, Jimi Hendrix, Bob Dylan. I became a fan of all kinds of good music and the emotion it can capture." At age 12, Bill got his first guitar. Although he played in teen rock bands for a few years, he soon tired of it. Trading his electric guitar for an acoustic, he began to play folk music and bluegrass, as well as taking up the Native American flute, which he came to master. "With the flute, the breath speaks for you," says Bill. "It's a faith instrument, a spirit instrument." For Bill, the turning point came when he attended a Pete Seeger concert shortly after leaving the reservation to study art at the Layton School of Art and Design in Milwaukee (he later attended the University of Wisconsin at LaCrosse). The experience inspired him to move to Nashville to pursue a career as a singer/songwriter. In the early days, Bill often faced virulent racism because of his Native American heritage, but he persevered. In time, he made tremendous inroads, writing songs with the likes of Nancy Griffith, Peter Rowan and Kim Carnes, and sharing the bill with such diverse artists as Pearl Jam's Eddie Vedder, the BoDeans, Richie Havens, and Arlo Guthrie. He got a big break when Tori Amos asked him to be her opening act on the Under The Pink U.S. and Canadian tour. The tour, which sold out venues across the country, was extended to over two hundred shows. Despite some setbacks, including battles with alcoholism and family tragedies, Bill never stopped growing as a singer, songwriter, and performer. His long recording career includes such landmark albums as Loon Mountain And Moon (1991), Red Road (1994), Reservation Road, Raven In The Snow (1995), Ghost Dance (1999), and The Art Of Survival (2000). His song "Tumbleweed," co-written with Peter Rowan, was included on the 1990 album Dustbowl Children. 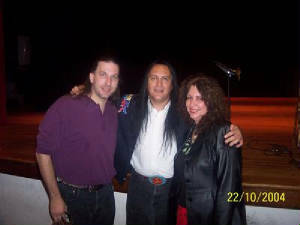 Ghost Dance brought Bill some long-deserved recognition at the 2000 Native American Music Awards. He took home five Nammys that night, including Artist of the Year, Album of the Year, Songwriter of the Year, and Song of the Year. With up to 200 days a year on the road, Bill and his band continue to make friends across the country and around the world. It may sound grueling, but for Bill Miller it's all about the joy of sharing music. With his new album's, Bill hopes to further inspire fans, both present and future. "My faith in my Creator leaves me content with the gifts I have," he says, "and I use them to enrich the world through His blessings. I choose to bless people rather than curse them, to be a peacemaker rather than a warmaker." As songs like "The Promise" make clear, Bill feels just as passionate about saving the environment of North America, the land of his forebears. " I think we should feel as if we're living in the Garden of Eden, and we should take care of the land," he says emphatically. "I'll always use my music to urge people to preserve the land." Bill has an equally active career as a painter. His work has been shown and sold in prestigious galleries around the country, and he maintains a studio at his Nashville home, where he lives with his wife and children. With so busy a personal and professional life, it would seem that Bill Miller could cruise ever onward in easy contentment. But artists don't work that way. "I've been given a lot of second chances in my life," he says. "I've been through alcoholism and other problems. I was lifted out of the ditch, and I still see a blue sky above. After years of living against the grain, I see things as rivers, creeks and rainstorms, as the liquid layers of my life." And this is the essence of Bill Miller on both Spirit Rain and CEDAR DREAM SONGS.